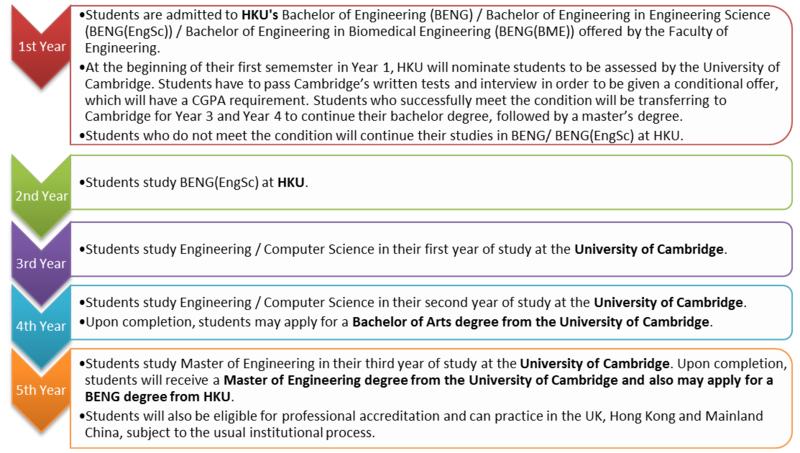 Under this HKU-Cambridge Undergraduate Recruitment Scheme (Engineering and Computer Science), students can graduate with three degrees: two Bachelor degrees from the two universities and a Master of Engineering from the University of Cambridge upon successful completion of five years of study. This is a programme for engineering students. Upon completion of the 5-year programme, successful students will receive a B.A. degree and a M.Eng. degree from Cambridge. They are also eligible to apply for the HKU BENG degree. Students will pay regular tuition fees at the host institution (two years at the University of Hong Kong and two years at the University of Cambridge) fixed at the time of enrolment. HK$164,000 p.a.1 Approx. £30,000 p.a. Approx. HK$12,000-HK$26,000 p.a. College fees: Approx. £6,500 to £12,500 p.a. Approx. HK$40,000 p.a. Approx. £10,500 p.a. 1 Subject to change. For students who have Right of Abode in Hong Kong, local fees of HK$42,100 p.a. apply. Student may apply for scholarships sponsored by Cambridge overseas trust. Students may apply for colleges' scholarship. HKDSE students who wish to apply for entering HKU-Cambridge Undergraduate Recruitment Scheme (Engineering and Computer Science) should follow the below application procedures. Apply for admissions to JS6963 Bachelor of Engineering or JS6951 Bachelor of Engineering (Engineering Science) or JS6925 Bachelor of Engineering in Biomedical Engineering offered by HKU Faculty of Engineering, and place the programme choice(s) in Band A. After being admitted to HKU Faculty of Engineering, students can apply for entering the scheme. HKU Faculty of Engineering will conduct preliminary screenings, and successful applicants will be admitted to the scheme. Students admitted to the scheme will receive HKU's nomination to be accessed by the University of Cambridge. Successful students will continue their 3rd year of study at the University of Cambridge. Unsuccessful students will continue their study at HKU Bachelor of Engineering. 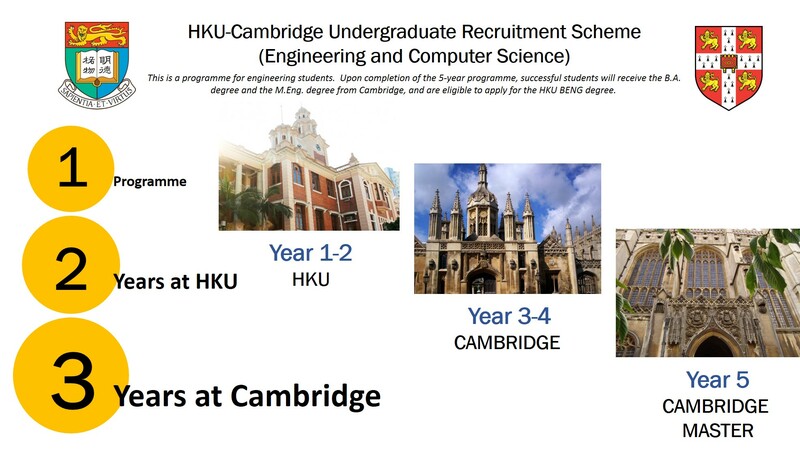 International students studying IB Diploma, GCE A Level or SAT/AP or other national curriculum who wish to apply for entering HKU-Cambridge Undergraduate Recruitment Scheme (Engineering and Computer Science) should follow the below application procedures. Apply for admissions to Bachelor of Engineering or Bachelor of Engineering (Engineering Science) or Bachelor of Engineering in Biomedical Engineering offered by HKU Faculty of Engineering, and place the programme choice(s) as first choice. After being admitted to HKU Faculty of Engineering, students can apply for entering the scheme. HKU Faculty of Engineering will conduct preliminary screening, and successful applicants will be admitted to the scheme.